Tom Petty is a Southern boy who found you can go home again. In spirit, at least. Two years ago, in the midst of the creative dry spell, the Florida-born pop star turned to his roots for inspiration. He crafted an album called "Southern Accents" -- full of good ol' boys, strong-willed women and rebels with "One foot in the grave, And one foot on the pedal" -- that marched into the top 10 when it was released this spring. Musically, however, Petty and his group, the Heartbreakers, shot off in all directions, merging his tales of the new and old South with all manner of musical styles -- from straightforward rock 'n' roll to rhythm 'n' blues and avant-garde pop -- in an effort to rejuvenate his interest in making music. "I did this to save my sanity, really," Petty, 33, explained by telephone from his manager's Hollywood office. "We were on the 'Long After Dark' tour (1983) and I couldn't get interested in just going out and playing the hits night after night. "I wanted to get into something bigger, something that was more interesting than another album of love songs." With only a slight drawl remaining after 10 years of living in Los Angeles, the singer-songwriter-guitarist said a good portion of his character remains Southern. His father and brothers still live in Florida, and Petty often visits them with his wife and two daughters. His roots might be a surprise for some fans. His beach-blond looks are distinctively Californian, and his music -- including a string of hits like "Refugee," "Don't Do Me Like That," "The Waiting" and "You Got Lucky" -- have more in common with the Byrds and mid-'60s British pop than the twang-drenched boogie of Southern rockers like the Allman Brothers or Lynyrd Skynyrd. But "Southern Accents" sets the record straight, carrying a sense of Petty rediscovering how much of the South is still in his, and how it influences his life and music. "I'm glad people understand that we are Southern," Petty said. "I spent more than 20 years there, the music was formed there. I like it mainly 'cause there is so much music down there." More than anything else, the project gave Petty a fresh shot of enthusiasm for his career. Two years ago, he was tired of it all -- weary of touring, drained by various business hassles and, most damaging of all, afraid that his creative juices might have spent too much time in the same pitcher. He felt the (then current) album, "Long After Dark," sounded like a rigid rehash of his earlier work, and when he finished his tour in the spring of 1983, Petty put away his guitar, vowing never to pack it in its travel case again. "We'd been out there for seven years and had fallen into a routine," he said. "Just the routine of it wore us down. I was bored with what we were doing; I couldn't get behind it anymore. We said, 'This ain't why we started this band.' I didn't even intend to do any more shows when I stopped that tour. I planned to quit the road. I needed a few years to get out of it." He wasn't about to give up recording, however. 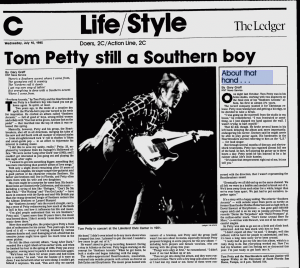 During a stop in Atlanta for the tour, Petty began working on the concept for "Southern Accents." When he got home, be built a studio and began tinkering with the songs. The under-appreciated Heartbreakers, meanwhile, ventured into outside projects with artists as diverse as Bob Dylan and Eurythmics. The music press buzzed with rumors of a breakup, and Petty said the group itself wasn't too sure about its status, especially because Petty proposed bringing in extra players for the new album -- including horn players and female vocalists, who are touring with the group this year. "Things were edgy at first," he remembered. "I didn't know if we had broken up or not. "Then we got into doing the album, and they were concerned at times. There were a few long talks about whether I had lost my mind or not. Some of them were concerned with the direction, that I wasn't representing the Heartbreakers sound. "Eventually we all did end up on the same channel. We all felt we were in a bubble and needed to break out of it. We'd been away from each other for a while longer than we've ever been apart. We just had to put ourselves together again." It's a story with a happy ending. The eclectic "Southern Accents" -- with outside input from peers as earthy as former Band leader Robbie Robertson and as high-tech as David Stewart of Eurythmics -- has gone gold (500,000 copies sold) and is on its way to joining previous Petty records "Damn the Torpedoes" and "Hard Promises" at the million-seller mark. "Don't Come Around Here No More," co-written with Stewart, was one of his most successful singles. So Petty was able to go out on a limb and climb back unharmed. And his fans stuck with him to boot. "I didn't expect all this," he said. "I thought, well this (album) will be hard for people to understand, and, boy, it's been a long time since we've been around. "I really had to put my life into this album, which is a risky thing to do. But everything worked out. Now I've had my breather, and I'm feeling not so distracted this year. I'm just ready to get back into it." One night last October, Tom Petty was in his home studio, working with two engineers on the final mix of his "Southern Accents" album, his first in almost 2 ½ years. The record company wanted it for Christmas release. Petty was running late and getting a bit edgy, so he decided to take a break. "I was going up the stairwell from the studio to my house," he remembered. "I was frustrated or something, so I just slapped my hand against the all. I wasn't trying to hurt myself." That he did, though. He broke several bones in his left hand, delaying the album and, more importantly, endangering his career. Doctors said he might never be able to play guitar again. His bandmates in the Heartbreakers started referring to him as the "L.S." -- for lead singer. But through several months of therapy and electroshock treatments, Petty has regained almost full use of the hand. In fact, he's playing his guitar up to three hours a day. Petty notes he has learned to be a lot calmer about life's little hassles. "It's taken that temperament right out of me, let me tell you."